Buying refurbished IT hardware will save you anywhere from 50% to 90% off the list price of a new server, PC or laptop and almost always provide a better specification to boot. Whereby the price of new server options and CPU upgrades can be prohibitively expensive for all but the most extravagant of budgets, used and refurbished hardware components offer just the same reliability at a significantly discounted price. New equipment must recover research and development costs, as well as major marketing and engineering overheads. All of these costs are absorbed by the large corporate and public sector entities with their initial purchase. By the time they decide to refresh their equipment the initial outlay has been written off, providing for huge discounts in the secondary market. At Bargain Hardware we hold tens of thousands of DDR RAM modules, Intel CPUs, Hard Drives and Interface Cards in stock at any time. This provides the opportunity for you to max out your build to order system with a top of the range spec and still make huge savings against a new machine. All the servers, Desktop PCs, workstations and laptops that we refurbish at Bargain Hardware have been removed from working environments and undergone extensive diagnostics both into and out of our facility. We only sell business class hardware which has already proven itself to be reliable in a real world scenario and undergone extensive testing to ensure that it remains in perfect working order. The net effect of this in-situ usage and testing is hardware that is arguably more reliable than new systems, which don’t have anywhere near the same level of burn-in testing. At Bargain Hardware we firmly believe in the quality of our refurbished products and as such, everything we sell is backed by 12 months RTB warranty. We specialise in providing business class hardware, designed and manufactured to be more reliable, durable and longer lasting than consumer grade equipment. Professional product ranges from HP EliteDesk and Dell Optiplex desktop PCs to Lenovo Thinkpad and HP EliteBook laptops command a premium price from new as their features and components are targeted at the corporate and public sector markets where performance and dependability is paramount. With superior build quality, higher spec components and enhanced security features, the only reason not to buy business class computers is usually cost. However, with a refurbished system from Bargain Hardware often costing less than 50% of the equivalent new consumer grade equivalent, the choice is obvious. Buying refurbished computers is a responsible, sustainable approach to IT hardware procurement. Reusing perfectly good equipment reduces drain on our planets finite resources, providing a meaningful way to prevent e-waste pollution. Recent studies have shown that up to 12 million used desktop computers are retired annually in the UK alone, with a further 76 million discarded across the EU. 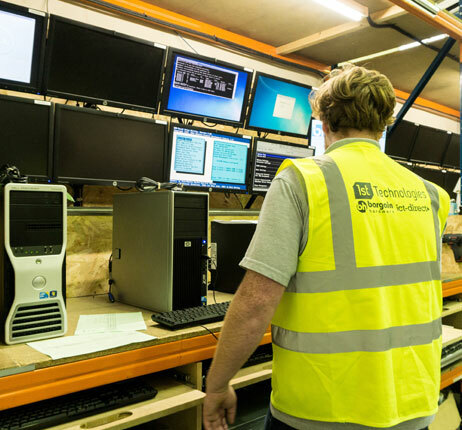 A refurbished server or PC is the ‘green’ solution, reducing landfill use and ensuring your company’s brand is promoting an ethical image for an increasingly environment conscious audience. After having being carefully removal from its working environment, used hardware to be refurbished arrives at our facility where it is carefully unloaded and stored in our pallet storage area, joining the inbound processing queue. Any dirt and dust is carefully removed from inside the system. Vents, fans and all surfaces are cleaned using professional grade cleaning products. 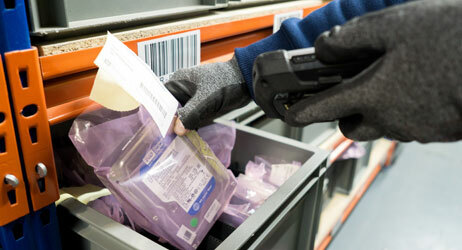 Any labels and asset tags are carefully removed before the equipment is sent for grading. Once cleaned and graded, all systems and components are stress tested with our proprietary inbound diagnostics software, as well as the relevant manufacturer’s tools, to ensure full functionality. Secondary checks are made to ensure that all data is erased from previous use. In order to ensure that the broadest selection of components are available for your custom build configuration, all systems are then carefully stripped down to base configuration and the components readied for adding to our inventory system. 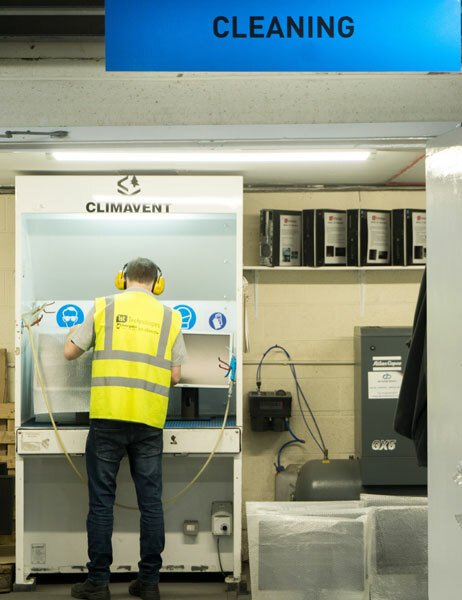 Individual components are catalogued, placed in secure anti-static storage containers and added to our state of the art inventory system which immediately reflects on our website as being ready for order. The inventory is now ready for you to purchase online having being put-away on the shelves. 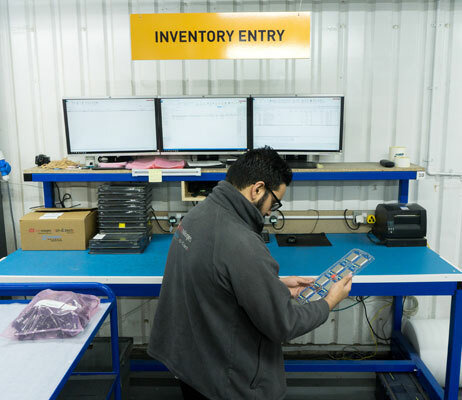 As orders for configure-to-order systems or individual components arrive, stock is reserved and picks are generated for the required warehouse locations. The picking team move parts to the assembly area in the case of build to order PCs/servers/workstations, or straight to dispatch in the case of individual components. All custom build Desktop PCs, servers, workstations and laptops are assembled in-house by our expert technicians in a static free environment. Our assembly technicians take great pride in their work and in ensuring a build quality as good as the original OEM build. Only when these tests are passed are systems sent to fulfilment and dispatch. With your order having passed through final quality checks it’s on to packaging team to prepare it for a safe onward journey. With custom moulded foam inserts and stress-tested corrugated cardboard boxes, our continual investment in only the best packaging solutions ensures a reliable transit to your destination.